from everything i've read about the original, even the chicago iron clone, states it's a positive ground effect. without having one in front of me i really can't say, but i'm going off of what is known about it online. if both work and sound right, that's all that matters to me. 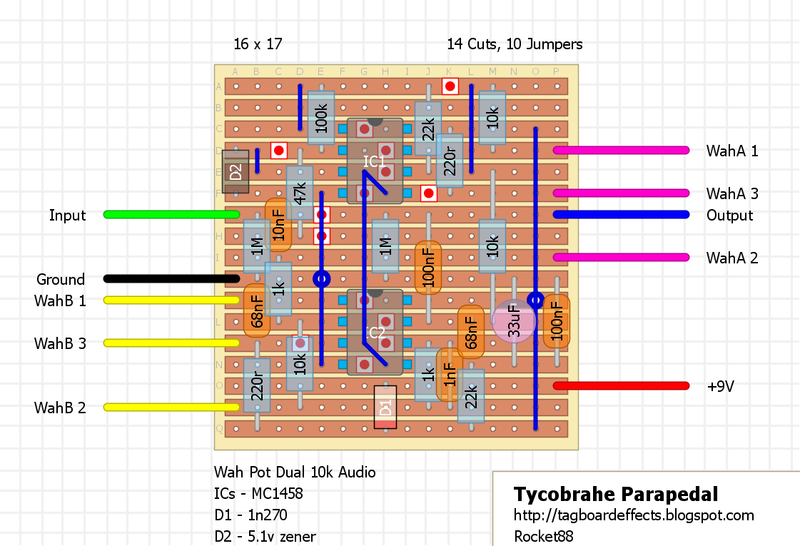 there are some differences between the schematic from R.G. Keen and the one Ciaran posted and i came up with the same thing. Excellent layout Zach! Busting to get cracking at this as soon as I get back to work (don't tell the boss thats what I spend most of my paid day doing!!!) I've an old Crybaby Bass enclosure just waiting for a new lease of life. Regarding D2. I think I got it wrong on the schematic. Gregory says his original is a 5.1v zener. I could only see the 1N on the pic and assumed a 1N4xxx. It needs flipped on your layout as well. Cathode to pin 3 of IC. Once again top job! If no one gets it verified by the 7th I'll have it done by the 8th. Is someone going to fix the polarity of D2 in the drawings? It is reversed in both the Positive and negative ground versions. D2 is in the correct orientation in both layouts. Somebody please verify this!! It looks very awesome. You can tag the bottom Negative Ground version as verified with the changes Ciaran mentioned. I used a 1N4733 instead of a 1N4001 with the cathode on top (Row D). I only had a dual A20k pot and the signal drops out when turned fully CW. So I tried it with two individual A10k's and it is fine through the whole sweep. So anything above an A10k is no good. Also you can get some interesting tones using the two separate pots if you wanted to build it as a dual filter cocked wah pedal. I have just built the positive ground version. There is sound coming (lower than the bypass signal), but no effect. Any ideas? OK. I’m getting around -9 V everywhere, if I set the black probe to the red side of the battery (+). I have checked all values and all connections and I can’t find the error. I am using a negative voltage converter (as I did on my positive ground build based on the RG Keen Layout which worked fine) and a Millenium Bypass. I have also tried it without the converter and without the Millenium Bypass, but no success. I have rewired the pot and resoldered some connections and now I get the around -7.5 V at pins 1, 2, 6 and 7 on both ICs and -9.45 V at pins 3, 4 and 5. Pin 8 is 0 V.
This time no sound at all, just a bit of noise, when the pot is turned. I am using a ZPD5V1 for D2. Is that OK? I was also wonderings about the differences to this layout here which I found somewhere on the internet some time ago. Or do the drawings refer to a negative ground schematic? Here are some pictures of my build. They didn’t have ¼ oder ½ watt resistors in the store, only 1 watt resistors and 630 V capacitors, so the components are quite big. I have also checked all legs for shorts and couldn’t find any. 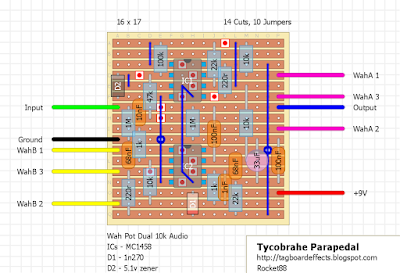 Actually, I think there's an error in the -9V layout Zach. D2 should connect between Pins 3 and 4 just like the +9V layout (the diode is still the wrong way round too sorry....cathode to Pin 4 in -9V, cathode to Pin 3 in +9V). In the -9V version, D2 is connecting to Pins 2 and 3 when it should be 3 and 4. Jim...remove D2 and make the connection I described above. You can omit the small link and just stand the diode. I don't think standing components are a worry with all those 1W resistors lol. You will also need to move the top leg of the 47K one hole to the right and make a new cut where that leg currently is shown. I've also uploaded a pic highlighting what looks like some trouble areas. Have to look and check with a DMM that there are no bridges. 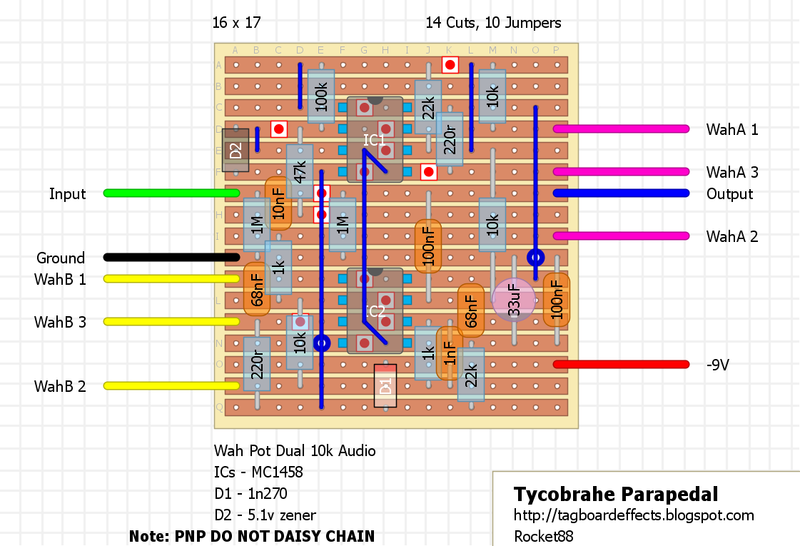 I did as you said, but still no success … Shouldn’t D2 connect between Pin 3 and 8 in the -9V version? Pin 4 is ground in the +9V version, but in the -9V version pin 8 is ground. Or am I completely wrong? I have connected cathode of D2 to Pin 8 (ground) now. Now the pedal "works", but there’s still something wrong. The pot doesn’t have the full range, the signal is cut. Maybe the 220R resistor (to which WahA 3 is connected) should go to Pin 4 instead of Pin 8? weird, i must have reuploaded the old layout. just updated with the correct ones. 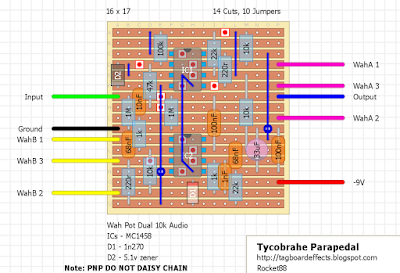 D2’s cathode needs to connect to ground and the 220R resistor (the one which is connected to Wah A 3) needs to connect to Pin 4 instead of Pin 8 of IC1 . I have also built the NPN layout and it works great, thank you! Can any of you folks who have built this share where you purchased that dual gang A10k? Since they seem pretty pricey, I'd like to make sure I order the correct one! Thanks in advance. What is the best way to do the offboard wiring (with LED)? I've used the Skreddy TB method, and I seem to be getting clean signal along with the effected signal when the effect is engaged. Thanks for sharing the layout. The effect sounds great! I've just gotta get that one thing sorted. Cheers.